To improve performance, but we also believe it’s about saving money. Experienced in supplying lubricants at more than 800 ports around the world. Authorized Contractor and Supplier of Directorate General Defence Purchase, Ministry of Defence, Pakistan. United Enterprises optimizes the performance of the main engine and auxiliary systems. Complete range of aviation and marine fuels. 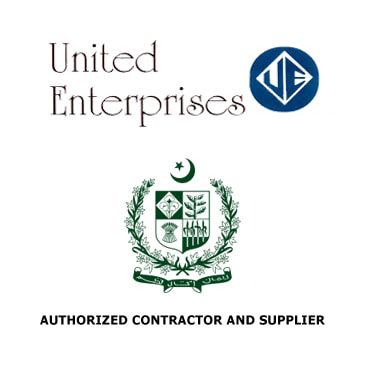 United Enterprises supplies a vast range of marine, defense and commercial industrial Products. The firm holds 37 years of experience in this business, and has earned immense appreciation and recognition from its valued customers including military authorities. Its rich history and numerous awards, are all evidence of how UE strictly adheres to its core values. The firm places a significant focus on quality assurance, conformation with specifications, cost efficiency, timeliness, proficiency and all other dimensions valued by its customers. We have specialized experience in supplying premium quality lubricating oils, exclusively used by the defence sector. Our products are in absolute conformation with NATO, JSD & MIL specifications. UE’s highly experienced lubricant’s team is available round the clock to address customer inquiries and render consultation services. We offer a vast range of marine products. We supply a variety of military and marine products including NATO specified fuels for marine fleet, aircraft engine fuels, specialist turbine fuels and calibration fluids for overhauling aircraft fuel systems. We offer a varied collection of firefighting foam concentrates to control fires and to coat the fuel, preventing its contact with oxygen, resulting in suppression of the combustion and extinguishment of Class A and Class B fires. We supply a full range of aviation and land petroleum, oil and lubricant (POL) products in accordance with the local or customized specifications set by the customers. The specifications include both commercial and military specifications. The Firm aims to achieve infinite excellence through performance and reliability. Our primary objective is to capture customer delight through delivering quality product and services within delivery period. Our dedicated staff members make utmost efforts to fulfill customer demands and provide products at the lowest possible cost. We strictly adhere to set of values and belief that has restrained us from any unethical act and has earned us immense loyalty and reputation among our customers.